Cycling is fast becoming a popular pastime in the Maltese islands. Although the private car remains king as the favoured mode of transport, motorbikes and bicycles have their distinct advantage when it comes to navigating the often congested roads around Valletta and Sliema especially. But of course the real pleasure of cycling is its pursuit as a purely leisure activity rather than the merely pedestrian activity to get one from A to B. While cycling in the built up areas of the inner harbour towns of Malta does have its pleasures and can be very rewarding in the exploration of such areas as the Cottonera, the vehicular traffic can be quite a nuisance at times. On the other hand the exploration of country roads is more rewarding – with the added advantage that traffic is negligible. 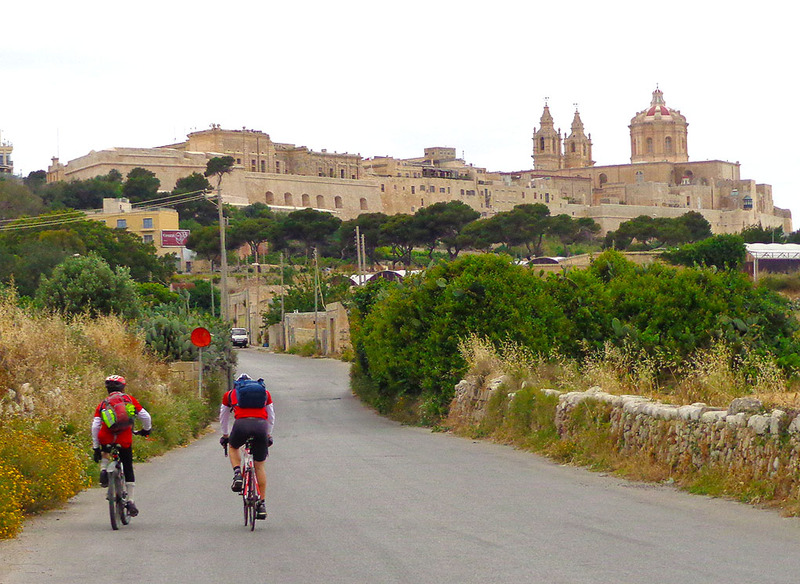 The Maltese Islands have improved their countryside cycling infrastructure. By means of the EU-funded project SIBIT (Sustainable Inter-Regional Bike Tourism), Malta and Gozo have benefitted from over 140km of newly designated cycle routes, resulting in the development of three principal itineraries. The three routes have been designed with safety and accessibility in mind and aim to avoid primary roads wherever possible, keeping gradients safe and distances medium (25 to 45km). They focus on historical attractions, countryside and villages and are best suited for mountain bikes. 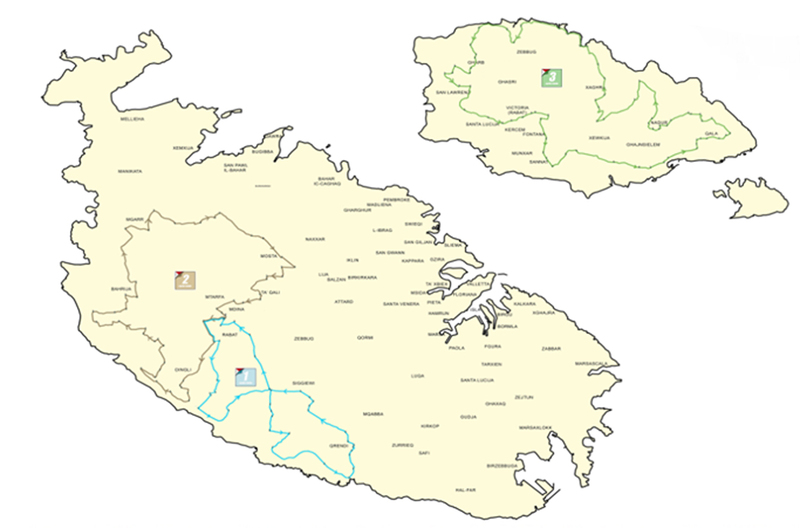 The first of the SIBIT routes is in the North-West of Malta and starts from near the Roman Domus in Rabat, passing through Kuncizzjoni, Dingli, Bahrija, Mgarr, Mosta and Mdina . This route is approximately 34 kilometres in length and can best be described as a cycling journey that provides an opportunity to discover the rural aspect and natural landscape of the idyllic northwest part of Malta. It requires just over two and a half hours of cycling. The route is the easiest of the three and is suitable for cyclists of any ability. The second route is in the South-West of Malta and also departs from Rabat’s Roman Villa. This route meanders through Buskett, Girgenti, Lapsi, Qrendi and Siggiewi and is a cycle across 4000 years of history complemented with great views of Dingli Cliffs, Blue Grotto and the south of Malta from Girgenti Valley. At a length of 27km the route is classed as one of medium difficulty but nevertheless accessible and pleasant. 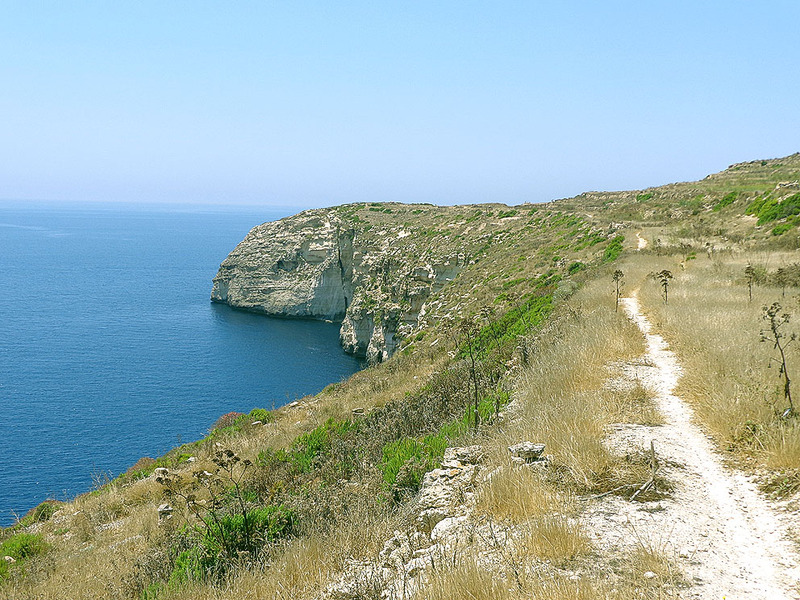 The third itinerary covers a very scenic route in the island of Gozo. This route departs from the Port of Mgarr from where the Gozo Ferry operates, making it easily accessible to day-travellers. The route is a circular one which traverses the picturesque villages of Ghajnsielem, Xewkija, Sannat, Victoria (Rabat), Kercem, San Lawrenz, Gharb, Zebbug, Xaghra, Nadur and Qala. Highlights include some stunning views along the Gozo channel, the Qbajjar salt pans, the cliffs past Wied il-Ghasri and Ramla Bay. The route is 42 kilometres in length and requires about 3 hours cycling, making it an ideal challenge for more advanced bikers. All three routes are signposted but the option of diverting from the recommended routes and exploring further can be quite irresistible as well and one shouldn’t be discouraged from this. Given the size of the islands, getting lost for any length of time is almost impossible! Cycling in the islands is best suited for the months from October to May. In the heat of the summer months cycling is best practiced from around 5pm onwards when it is cooler and one still has from three to four hours of daylight in which to enjoy the activity. There are a large number of both bicycle rental and repair shops around the islands and in the summer months bike rental is also available on the tiny island of Comino – the island itself provides an excellent wild ride in a completely car free environment.